This week was spent recovering from an awesome week in Colorado, while acclimating myself to the to the torturous throes of a new quarter. It’s always hard to go back to real life and resume classes after taking a break from school, but it’s even harder when you’re coming from an amazing ski trip. I’ve been skiing for the last six years, but I’ve gone more this season than ever before. I first learned to ski when I was a freshman in high school, three months after my amputation. I attended a ski trip in Park City, Utah, with One Step at a Time, a camp for kids with cancer that I’m very involved with. I fell in love with it that very first year, and ended up returning to the mountains every year of high school. Skiing will always have a special place in my heart—there’s something about the sight of snow covered aspens and the smell of fresh mountain air that really gets my heart racing. While most normal college kids go to Mexico for spring break, I would choose a vacation in the mountains any day. This whole trip was made possible by a woman named Mau, who I met at an event in Chicago earlier this year. Mau works for Adaptive Adventures, an organization I work closely with here in Chicago. 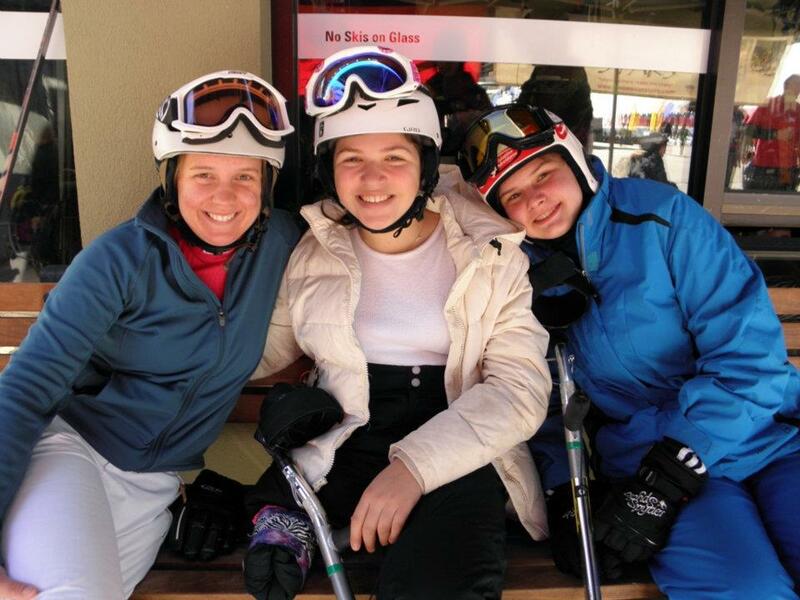 She is one of the best adaptive ski coaches in the country, and has a team of Paralympic hopefuls that she trains in ski racing. Last month, she invited me to her home in Winter Park to ski with her and some of the team, and I decided that I would be crazy to say no. We skied together for three days in Winter Park, where she gave me gave me lots of valuable instruction on how to improve my technique. Knowing how important triathlon is to me, Mau made sure that my training didn’t stop just because I was on vacation. On our way home from the mountain, she would drop me off at the gym with my running leg and swimsuit, an action that was very much appreciated on my end. It was at they gym that I learned that training at altitude is a very miserable experience, but that coming back down is pretty sweet. In the middle of the week, we made the beautiful 2-hour drive from Winter Park to Steamboat, where Adaptive Adventures was hosting its annual adaptive ski camp for kids. I was the oldest girl in my condo by a few years (in fact, it wasn’t until I arrived in Colorado that I found out I was a participant rather than staff), so my inner 12-year old ended up having a blast. It was most definitely spring ski in Steamboat, hitting a high of 65 degrees every day we were there. Because it was still below freezing overnight, the hill was super icy in the morning. Over the course of the day, the snow would soften, until about noon when it turned into a giant slush fest (seriously, all we needed was a little artificial flavoring and we would have been able to stock every 7-Eleven Slurpee dispenser nationwide). I legitimately contemplated doing a run in my swimming suit, but ultimately decided that I wanted to maintain a little bit of self-respect. Instead, I opted for the classic t-shirt and ski pants ensemble (I’ve got the farmer’s tan to prove it). Skiing in nothing but a t-shirt is a pretty awesome feeling—that is, until you can’t catch an edge in all of the slush and then wipe out and get ice burns all over your arms. Despite the conditions, it was a beautiful week filled with good skiing, great friends, and lots of singing on chairlifts. The week was about much more than skiing, and I ended up learning lessons that I can apply to my athletic career more generally. In addition to being a ski coach, Mau is truly a life coach. She talked me though what it was going to take for me to go from a recreational triathlete to an elite one. We discussed my goals, the potential for sponsorships, as well as the mental aspect of competing. She really forced me to dig deep within myself and challenged me to change my attitude towards competition. Before I flew back to Chicago, I also caught up with my friend Sandy, whom I met when I was in Colorado earlier this year and who quickly became a mentor to me. Sandy is also an above-knee amputee who competed as a Paralympic ski racer before switching to triathlon. She and I had the chance to discuss many of the same things that I had talked to Mau about earlier in the week. Thank you Mau and Sandy, for helping me reach this realization. And thank you Adaptive Adventures, for an amazing week. I’m already looking forward to next ski season. But until then, I’m ready to rock the hell out of the triathlon world.